Product prices and availability are accurate as of 2019-04-19 09:06:18 UTC and are subject to change. Any price and availability information displayed on http://www.amazon.com/ at the time of purchase will apply to the purchase of this product. 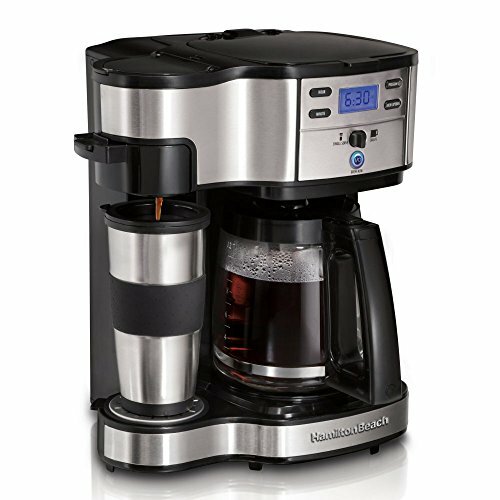 Whether at home or on-the-go, the Hamilton Beach 2-Way Brewer Coffee Maker is here to make sure you're always caffeinated and ready for the day. This convenient coffee maker allows you to easily brew an entire pot or a single cup as needed. The pot features a pause-and-serve no-drip design. An automatic timer allows you to easily set up your grounds ahead of time to have it ready as you step out of the door. Includes a basket filter and a glass carafe. Brews a single cup or a 10 cup carafe. Includes a glass carafe. Automatic shut-off. Digital clock timer. 2 settings for brew strength. Dimensions: 12.23W x 11.08D x 13.9H in..